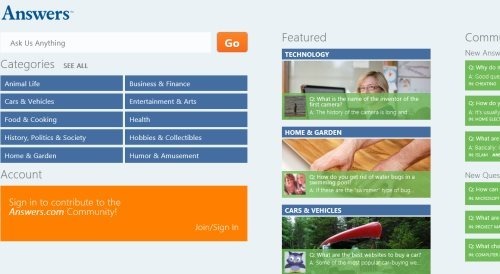 Here are 3 free Windows 8 apps to ask questions where you can ask any type of question… it may related to your life, science, relationship, technology, nature, or just anything. If you want a solution to your problem, then try any of these Windows 8 apps. Answer Me! is a free Windows 8 app that lets you ask any type of question, from within the app. It, then delivers the solution to that question fast using Yahoo Answer. You can easily use this Windows 8 app to look for answers in multiple regions such as US, UK, Canada, Australia, India, Spain, Brazil, Italy, France, and the like. There is a list of categories that you need to choose from and ask question by typing it in the Search bar. In case, you want to change the region, just right-click anywhere on the screen and you will get the option to change the region. In order to access the categories, you need to click on ‘Settings’ icon given at the right side of the screen ? it will quickly come up with options to choose a category and to choose a type. You are now good to go. It’s very easy and fast to get the best possible answers. Go ahead and download Answer Me! app in Windows 8 now. The most trusted place for answering all your questions – Answers.com is now available as a free Windows 8 app. There are over 75,000 people actively participating in asking questions, answering existing questions, learning new things in life, and sharing your thoughts towards a specific subject. There are thousands of topics and categories to explore and to answer. Anyone can easily ask any type of question, can answer any question, edit your answers to improve and more. As you open the app, you will find a ‘Search box’ along with the list of categories. To view all the categories, you need to click on ‘See All’ button and it will bring you a long list of categories such as Animal Life, Business & Finance, Cars & Vehicles, Food & Cooking, Health, Home & Garden, Jobs & Education, Relationships, and many more.. Also, you will find a ‘Featured’ section where you will find all the daily featured questions along with the answers. Answers.com comes with account login feature wherein, you will find all your questions and answers stored. You can ask as many questions as you want and get the best answers, instantly. You can also pick any question and answer that question, from within the app. Go ahead and download Answers.com app in Windows 8 now. Also, check out our posts on Stop Watch Apps, Todo List Apps, and Password Generator Apps. Available under the ‘Social’ section of Windows 8 app store, Askall that lets you ask any type of question in their community and get suggestions from people. It brings you the thoughts of different people.. basically, what other people think about a particular subject. You can also compare the votes given on your answers with those of other people. In order to get started with Askall, you need to sign-up via Facebook or via other Email ID & Password. Once you are done with all these formalities, you are now going to proceed. As you login, you will find top community questions in tiles form. Now, to view more, you need to click on ‘See More’ button given at the left-side. This will bring you a screen where you will find questions categorized into various sections such as Technology, Leisure, Sport, Love, Science / Culture, Society, Media, and more. It’s very fast and effective way of finding best possible solutions for all your problems. Go ahead and download Askall app in Windows 8 now.